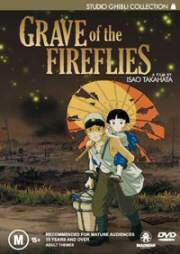 This page contains a listing of home video releases of Hotaru no Haka (Grave of the Fireflies). You can order these titles through anime import stores listed in our Shopping Guide, though some of these titles may be out of print. If you have additional information on any of these titles, information on any titles we missed, or scans of any of the covers, please let us know. 2 Discs. 1.85:1 anamorphic widescreen. English & Japanese audio (both DD 2.0) with English subtitles. 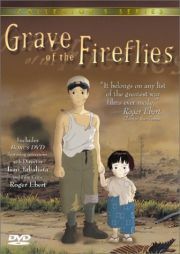 Japanese and English audio, English subtitles. Widescreen (1.85:1 aspect ratio). Dolby Digital Stereo. Includes chapter stops, a character gallery, and historical background information. One of the few legitimate All Region anime DVDs. Japanese audio with English subtitles. Widescreen (1.85:1 aspect ratio). Stereo. Includes chapter stops. Widescreen (1.85:1 aspect ratio). Stereo. 1.85:1 anamorphic widescreen. English & Japanese audio (both DD 2.0) with English subtitles. Same features as the Swedish DVD. Single disc. 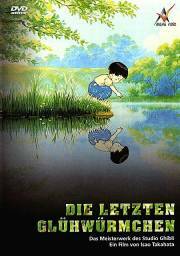 Japanese and English audio (both DD 2.0) with Swedish, Finnish, Norwegian and Danish subtitles. 2 Discs. French, Japanese, and German audio tracks with French (normal and hearing-impared) and German subtitles. Bonuses include: documentary (1.5 hour), making-of, interview with Takahata, 3D menus, image gallery, 32 page mini-book, trailers, original book by NOSAKA Akiyuki. 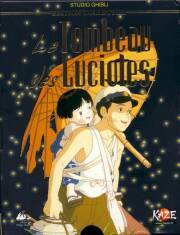 Japanese and French audio, French subtitles. Single side, dual layer. Widescreen (1.85:1 aspect ratio), anamorphic 16:9 enhanced. Dolby Digital Stereo. 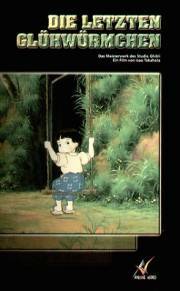 Includes a 30-minute interview with Isao TAKAHATA. Limited to 10,000 numbered copies. 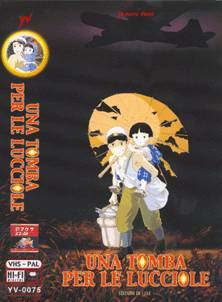 Japanese dub version with French subtitles and French dub on the same tape. Hi-fi stereo, widescreen letterbox (1.85). Two discs. French, German, and Japanese audio (DD 2.0) with French and German subtitles. Same extras as the French DVD. German, French, and Japanese audio (all DD 2.0). German and French subtitles. 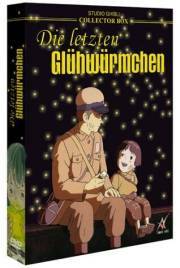 Extras include an artbook, postcards, and a copy of the Die letzten Glühwürmchen book. German, French, and Japanese audio (all DD 2.0). German and French subtitles. No extras. 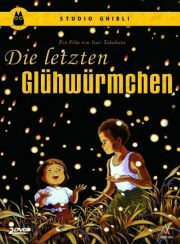 Pan and scan, German dub. Two discs. Hungarian (DD 2.0) audio with Hungarian and English subtitles. Extras on disc 1: trailers, trivia track. On disc 2: interview with the director, review by Roger Ebert, short film on the historical background, storyboards, image gallery (with Hungarian subtitles). 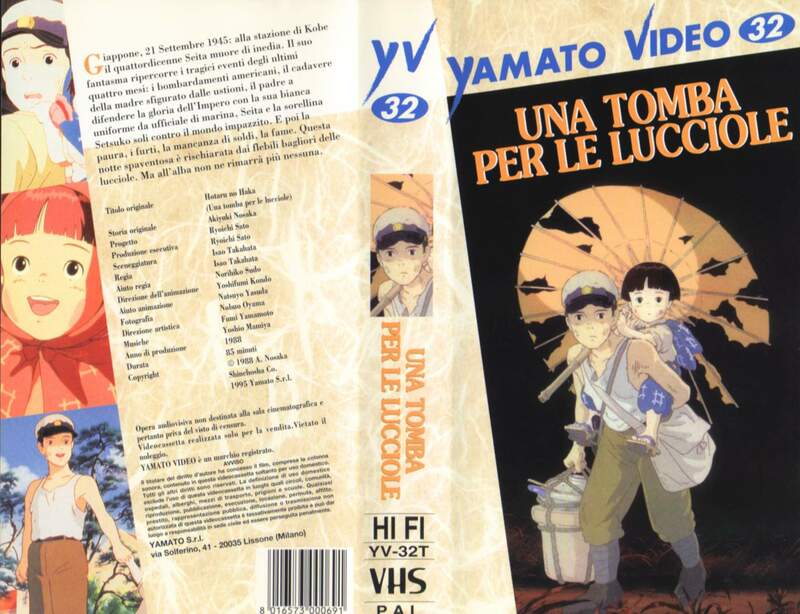 Italian (DD 5.1, 1.0) and Japanese (DD 1.0) audio, Italian subtitles. Widescreen (1.85:1 aspect ratio), anamorphic 16:9 enhanced. 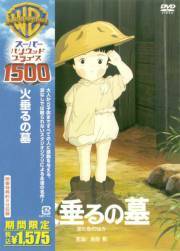 Includes interviews with Isao TAKAHATA, Akiyuki NOSAKA, and Nizo YAMAMOTO. 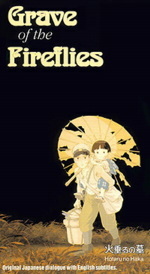 Click here for a full scan of the older VHS cover. Japanese audio (DD 2.0), Japanese and English subtitles. Single side, dual layer. Widescreen (1.85:1 aspect ratio), anamorphic 16:9 enhanced. Dolby Digital Stereo Surround. 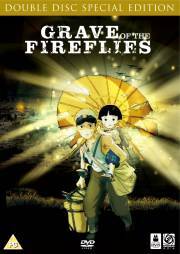 Includes interviews with Isao TAKAHATA (director) and Akiyuki NOSAKA (author of the book on which the movie is based). Also includes a film trailer. 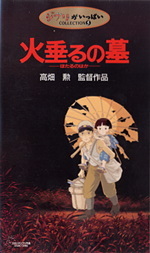 Same features as the original Japanese release at a lower price. Left-side of the cover is actually a paper overlay. Japanese audio. Widescreen (1.85:1 aspect ratio), digitally remastered. HiFi Stereo. Single disc. 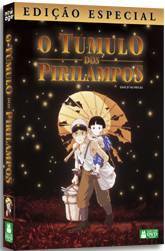 Japanese audio (DD 2.0) with Portuguese subtitles. 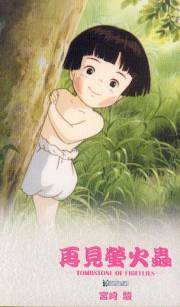 Extras include interviews with Isao Takahata, theatrical trailer, art gallery, and 16-page mini-book. Two discs. 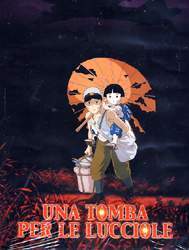 Spanish and Japanese audio (DD 2.0) with Spanish subtitles. 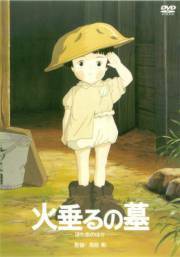 Extras include interviews with Isao Takahata (director) and Akiyuki Nosaka (author), staff interviews, a World War 2 documentary, photo album, Spanish dubbing documentary, booklet, four postcards, and a poster. 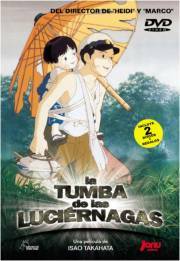 Pan and scan, Spanish dub. 1.85:1 Anamorphic Widescreen. Japanese and English audio (both DD 2.0) with Swedish, Finnish, Norwegian and Danish subtitles. Same extras as the US DVD release.